“If so, what was this diamond,” I thought. I know Jesus has given me everything, grace upon grace. But I was surprised when the first thing that crossed my mind was that he has given me the diamond of chastity, and it is of eternal value, and that it is my consolation now. Not too long ago, I ran across a secular video about celibacy. It was odd to watch because I am used to hearing about celibacy in religious terms, and this video’s attitude seemed to be, “Hey, look, people actually do this, and on purpose!” There were about five people presented with their various reasons for being celibate permanently or temporarily. The last person featured was a religious sister, who gave an explanation about Jesus being her spouse, and so her love in service was his love, broad, deep and available. I thought about my journeys as a wife and mother, then a widowed single mom, and the evolution of chastity’s meaning for me. We are all called to chastity according to our state in life. My state in life has changed in ways that have been confusing. What is my vocation now? I don’t think of myself as a single person, really. Being a widow is different. I am someone who lived and fulfilled marriage vows. However, I am alone. At the same time, I am much aware of a deep spiritual connection with my spouses, so in that way I am not alone. I am forever changed by marriage, in all the best ways, and I feel its beautiful seal on my soul. After the death of my first husband, Blaze, in a car accident at the age of twenty-eight, I didn’t understand what my life was- I lost that much of myself. I slept fitfully with the light on for years. It felt imperative to me to understand my vocation, to understand what I was supposed to build on and be. I was still a mother. I still loved my husband. Just because he was dead, I did not stop feeling like his wife. I didn’t even consider dating. I had some very intense little girls to raise, and challenges that were hard to accept were mine. Over the years my ideas about celibacy evolved as I moved from the chastity of a wife to the chastity of a widow. I was surprised to realize that I felt an expansiveness of love, of my womanhood, of my motherhood, as I developed in this new life I did not ask for, but slowly embraced. When I turned the light off at night, I felt enveloped in love and peace. I wondered, during the quiet mutations happening in my soul, if this was how priests and religious felt- like they were half in love with everyone, like their hearts were available to people, and to God in a special way. My marriages were beautiful and life giving. I was a very happy, totally in love, fulfilled wife, both times, in every way. My present choice of celibacy is not a repudiation of married love in the least. One woman on the video I mentioned said that she had always felt “asexual.” I wondered if she used that word only because she didn’t have the language to describe herself as a sexual being who is celibate in expression. In this present culture it would be hard to find any such language in every day public discourse. I have come to recognize sexuality as a spiritual energy, so to speak. It is like a power current and a connection, body and soul, to and through God. This was so when I was with each of my husbands, and it is so now. It is just directed differently. The proper direction of the spiritual energy of sexuality is what chastity is. Eventually I felt very happy and whole in my new life. I missed (and still do miss) my husband every single day. But more and more I felt that he was with me and part of me. I loved him as much as I ever did. And it was OK. It was because I felt married to Jesus. As my girls began to be interested in boys and have their teenaged heart breaks, I would tell them just to let Jesus be their boyfriend for a while. “He’s the best,” I would tell them. I was so perfectly at peace with this idea, that God is the husband of the widow and the father of the orphan, that it was a very difficult adjustment for me when I felt I was being asked to consider loving Bob, ten years after Blaze’s death. It took a lot of prayer, a few “burning bushes,” and a couple of little miracles to help me see that loving Bob was now my way. I came to understand that Christ and I were going to love Bob together. Slowly this began to make sense, and I was able to let that love happen. I was very, very happy as Bob’s wife. I was more happy and unified with him than I can say. He said we were each other’s priests one time and I laughed because that is not so far from the Catholic idea of marriage. Truly, we formed Christ in one another and experienced Him living in our relationship. In an ineffable way, though changed, it seems to me that we still experience that. Now the diamond of chastity is given to me again in different setting, with a new cut. I didn’t think this would happen again. But I cherish this beautiful gift. It is powerful and affirming. Truly, it is a wonderful consolation. I am still growing to understand it and let it be a fullness in my life. Widowhood is to live with a bottomless loss. But it is also a very special kind of love, and celibate chastity can be one of its expressions. It is less an expression of emptiness, in time, than a different kind of wholeness. This love, this diamond, is the gift left to me. I heard that a wife said to her dying husband, “I love you so much, what will I do without you?” He said, “Take the love you have for me and spread it around.” That is beautiful and I identify with it deeply, especially since that is something Bob would have said for sure. I think I have started to do this again now, and I recognize it as a sign of life. As Bob and I loved each other, and that love went out to others, this is what is happening in the relationship I am developing with God, in my life as a widow. This understanding of my present form of chastity is profoundly healing for me. I feel filled, enclosed, and loved, carried and protected every day, in spite of my still very present loss. Celibate chastity is a positive, liberating presence in me, peaceful and meaningful. To me, the virtue of chastity is a beautiful diamond, a true One Love that puts all other loves in their proper perspectives, making them even more vivid. Chastity is a vessel and an expression of love according to my state in life. But it is the same effulgence of brilliancy; a faithful, steadfast and complete love. The more I learn about it, the more I am dazzled. * Mountain of Light by Indu Sundaresan. A priest and I have met in a cool, bustling lobby on a hot summer day. We smile at one another. We don’t know one another really except by sight and a few short conversations. But we have a warm, positive regard for one another and I feel safe and encouraged as soon as he comes in. I am so grateful that he is here. We are about to head up to bless the place where my brother committed suicide. I know this is not a light task to ask someone to come along and join in. I came here twice before to make sure I could handle it. The first time I sat in stunned silence for an hour and a half without even realizing the time that had gone by. The second time I was pretty sad but I thought I was ready. I am ready. I am impressed that this priest who barely knows me responded to my request so readily and agreed to come here for this. He seems to understand the need for healing, both emotional and spiritual for all concerned. Our plan is also to commend my brother’s soul to God, and to pray in that place for my family’s healing. Father walks with me toward the elevators, which we take to a high floor. We walk down a hallway, then through a stair exit, and out onto a tiny bare balcony overlooking a pool area. “Just be however you need to be,” he says reassuringly. This is the spot where my brother, Mark, sitting on the railing here, shot himself and fell down to the concrete below even as friends and family repeatedly called his cell phone and frantically texted him begging him not to do it while the police looked for him not knowing where to begin. I have thought of those moments over and over, tried to understand, tried to feel the way he must have felt, wondered why it had to be this way, watched my family and our friends do the same. What is there to say in a place like this? After a time of respectful silence, Father talks to me earnestly about how the Cross conquers everything. “I believe that,” I say. He has such a kind face, I think to myself. It’s an easy, open, playful face, too. He is the kind of person who puts others at ease. I get out my phone and show Father one of my favorite pictures of my brother. I briefly tell him about Mark, about my symbiotic relationship with him, and what happened to him as best I am able to understand it now. This gentle priest takes all this in thoughtfully. He tells me what he would like to do, how he would like to proceed now. I show him what I have brought: a grocery bag full of rose petals, some bubbles; a small bottle for each of us. He smiles. He says the bubbles are a great symbol for what we are doing with the commendation. He blesses them. He puts a thin priestly stole over his shoulders and smiles at me. We begin with the Sign of the Cross together. He prays the prayers for the blessing of a place, telling me we are also reclaiming this place for God. In our prayers we invite the angels to come and drive every trace of evil from here. We bless and bring healing to this place where there was so much pain, where there was such a tragic, senseless death. Seriously and with purpose, he begins to fling holy water all around us; over the rail, down the stairs, all over the balcony, the walls of the building, and splashes it down to the concrete below. He blesses this place in the Name of the Father, and of the Son, and of the Holy Spirit. I tell this dear priest how hard it is not understanding what happened, and how I agonize still about how my brother could do this. Didn’t he know we loved him? Didn’t he know that any of us who loved him would have forgiven anything, given anything, done anything for him? How could he do this to us? Tears are running down my cheeks. I tell him how I have come to understand that somehow, that for some reason I will never know, my brother wasn’t able to let our love and support change what he did. Maybe to him we seemed so far away, he just didn’t know his way back. I have to cry a little bit. He reminds me that as Catholics we believe every soul is given a moment of choice at the time of death, an encounter with God’s merciful love and truth, so each of us has a chance to choose the embrace of mercy. He mentions that our Lord is here on this balcony with us, and that our Holy Mother Mary is here with us, too, to pray with us. I am moved to talk to her. I tell her I had never thought I would be OK again but now I see I can have a new life and that Jesus wants me to have life. I spontaneously renew my consecration to her offering my life to her and committing to follow her Son better than I ever have before. I can hear Father quietly praising Jesus as I speak these words of my new hope to Mary. In his gentle voice, the priest reads a reading from one of the Gospels, and we pray for my family’s healing. We pray the Our Father together. I pray for the deep inner healing of the Holy Spirit for each person in my family. We say Amen. We talk. We pray more. I tell him about the evolution of my understanding of my brother’s death through the tenderness of God in my prayer life right through all the horror of this death, this overwhelming loss, and fear I had of finding out something that would make this even worse. I explained that I still needed to understand all the same, and how I feel God helped me in His ingenious ways. I feel so much less alone as the priest listens quietly and with compassion to all I am saying. I don’t think even I knew how much this day would mean to me. I am grateful for his courage and kindness in coming here. He said he would like to pray the Prayer of Commendation now, that we use for funerals. He says it is our prayer to send the soul to God, commending the person to God’s mercy and love. It serves as some release to us too, allowing us to send the person forth with love, to God. So he prays the beautiful Prayer of Commendation. Together we pray a Litany of the Saints. 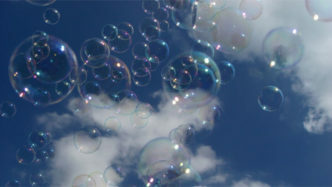 We blow bubbles and watch them glide out shimmering, into the sun, cascading down the side of the building, drifting out over the pool. We send streams of them up into the blue and watch them float gently. We can’t help but smile. We grab more and more handfuls of petals and throw them out, everywhere, like confetti at a party. Some of the petals drop quietly onto the water below, some waft out on the breeze, some scatter themselves on the patio. “Did you SEE that? !” he exclaims, as, amazingly, some of the petals suddenly spiral upward into the sky and away. Laughing we throw more and more of them everywhere, as if we are showering the world with roses. He takes some holy water and blesses me with the sign of the cross on my forehead. With trembling hands, I drape a rosary over the end post of the rail and fasten two white silk roses to it. You are not the way you died. 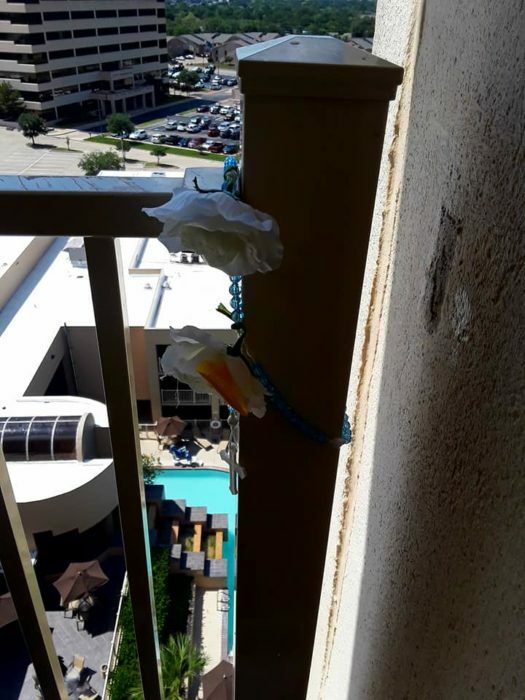 Smiling, Father and I take pictures of each other, of the balcony, of the draped rosary, and the scattered petals, so my daughters can see what this looked like today. We hug, and peacefully we leave the rose petal strewn balcony. Eternal rest grant unto him, O God. ~ And let perpetual light shine upon him. She remained still, even inside herself. She was still because she was listening for God, and she was occupied with His will, and, because of her love, being completely present as the unthinkable happened to her Son. The Scripture says only that she was there. There was no way her instincts as a mother were not the strongest that could be. However, she did not attempt to stop anyone, scream at anyone, blame anyone, say anything, do anything, but stand as she watched her Son be tortured and murdered before her. Any parent would find this hard to imagine. Since we know she was an incomparable mother, we know this stillness was not wrong of her. It was right. She chose to be still because she trusted Jesus, and she took her lead from Him. She remained focused on Him, and she let nothing get in her way. She would never let anyone steal her treasure: her union of heart and will with Jesus, no matter what was done to her heart and soul by what was done to Him. She faced everything, even this unbearable violence, as it happened, not knowing the future. Nothing could stop her from loving and doing what was asked of her in the moment, even if it was to stand and be desolated. And that is strength, if that is what is right. And it was totally right. In this stillness she kept, she was able to sense her call to ally herself completely with the offering of her Son and join Him. Her silent strength and her courageous proximity to her condemned Son must have been a rare wonder to those standing by. She needed to remain completely present to Him, loving Him. She wanted to be totally open to God’s plan as it unfolded in her life, no matter how horrific it seemed. She had to pay attention and keep watch with her Son, listening for the Holy Spirit, trusting the Father. She understood this, and nothing could stop her, not the hatred and mockery of the angry people around her, not the cold efficiency of the soldiers of Rome, not even her mother’s heart crying out within her in the face of what she had to see and experience. In the midst of all this, she was still. Such was her fierce focus and priority. She was neither passive nor weak. She was unbelievable. Her response of stillness on Golgatha models for us the Gospel meaning of turning the other cheek: “I will not be turned back from love.” Her eyes were on God. The sunlight obscures him in its intense brightness on the horizon, but I can still see his figure walking ahead as I follow at a distance. I have to run a little just to keep him in sight. I am wondering if he wanted some desert alone time and whether I should let him be. He seems to sense my hesitation. He turns to glance back at me, stops right away, turns on his heal and heads toward me more quickly than I would have thought walking would bring him. We walk in silence for a while. Eventually he leads me to where he has set a camp fire in front of a small cave. I am surprised he seems to be cooking. I thought we were fasting. He has made me a simple meal of lentils and bread. He explains to me that he knows that for me, especially at this time of shock, grief, and upsetting change in my life, eating is harder for me than fasting. This is why he asks that, for now, I take up the discipline of eating, of letting him feed me. This brings us to a larger issue that he wants to sit and talk over as we eat. He hands me a clay cup full of water and we sit on the warm ground to eat our meal. Even though we are quiet after the meal blessing, I sense that he wants me to remember that he understands what I am going through and that he experienced it himself. Briefly I remember it as he remembers it, that he was a man of sorrows, acquainted with grief of every kind. He wants me to remember so that I will feel deeply understood by him, and I do. He wants me to let go of what anyone else is doing, and of what unfolds around me, even and especially the things that hurt me the most. I have to think about this, too. He says he has heard my prayers asking what he would like me to do for Lent. His answer is that he wants me to take care of myself in ways that are hard for me right now. He goes over with me his idea of my to-do list. Me eating on a regular basis seems to interest him a lot. Me paying my bills on time and taking care of other things that are mine to take care of are high on the list. Me standing up for myself in certain matters that he wants me to seems important to him, too. He wants mercy in this: that I let other people love me, that I let him love me, that I take care of myself and my life with love for his sake. Well, this is different than what I was thinking. But I can see he’s serious. He has given me a lot to think about. In fact, I feel a bit upside down right now. The lunch he made is good and we eat in appreciative silence next to the fire in the shade of a rocky hill. I glance into the cave at his simple belongings- a bag of some kind, a sleeping mat. He catches my eye, and I look at him across from me, chewing casually on his piece of bread. Then I catch my breath because suddenly his eyes go straight to my heart, his gaze like a scalpel in the hand of a surgeon, laying my broken inner world open before me. I can see it in metaphor; a bombed-out building I have been trying to live in as if it were not rubble. I see the chaos from the outer world that I have let in like a flood of bad water over what little I had left to live on. I see that I did not welcome him when he came to pay his mourning call to me to comfort me. I had given him his usual seat, I had sat near him, so to speak, but did not allow more than his proximity most days. I did not care for myself, nor did I let him care for me. I did not see him cry for me. I was not looking. I don’t even know how to fix this problem; not this broken heart, not my inability to open it right now. He gently helps me understand that even this is not mine to do. I don’t have to do anything. I just have to be willing. I feel at peace as I look up and see only him, still chewing on his bite of bread, gently brushing off an ant. “In silence and in hope will be your strength,” crosses my mind. He shows me myself moving in tune with him through my days as I set about my house work, my bill paying, my phone calls, my cooking, driving, working, my encounters with others; in all these allowing him to care for me in how I care for myself. He shows me myself quiet in my prayer, breathing his gentle love, his presence, his mercy, his holy Name, into my broken heart, allowing him to rebuild, to redefine, to transform. The tenderness I feel from him is almost frightening right now, and I realize it is because of all the pain I have been feeling but trying to carry alone without realizing that was what I was doing. I need to trust him. I need to let him in more to the places that hurt. That is what he wants. I understand what he is asking me to do. I have to do what I am supposed to do in life right now, and it isn’t very much. He will take care of the other things. He will protect my heart. He will defend my heart. He will heal my heart, no matter how impossible it may seem, or how many times it must be renewed or even remade. He will do what it takes. He already did all this with his willingness to have his own heart, his own life, broken for my sake. I understand that he stepped radically into my sorrow, inhabiting it himself in his incarnation, his life, suffering and death. “Let yourself be loved,” wrote St. Elizabeth of the Trinity. “You are not your own,” says St. Paul. We are each bought at an infinite price and are of unspeakable value to the Lord of love. To love ourselves perfectly in God, through God, and for love of God, is the fourth and highest degree of love, that signifies union with him, wrote St. Bernard of Clairvaux. It seems to me the deepest and most humble of surrenders. This is my challenge to grow toward for Lent 2018. I look up at the bright sky, and suddenly he showers me with rose petals of every color. They smell beautiful as they fall around me and over me, sticking to my face and shoulders, piling up in my lap, getting between my toes. He is laughing. I smile. Jesus is Lord. He can laugh and dump rose petals over my head if he wants to. I will just have to get used to it. Sit quietly and recollect yourself. Imagine your heart, visualize it and keep your attention there. If your mind starts doing its usual job, thinking, gently bring it back to the prayer and continue mentally repeating it, visualizing your heart and keeping your attention there. Be patient and peaceful, spending some quiet time with God in this way. witnessed the exit of her spirit. I still need you, Mom. I will kiss every rose. “This is how,” Jesus says. I have been crucified with Christ, and the life I live now is not my own; Christ is living in me. I still live my human life, but it is a life of faith in the Son of God, who loved me and gave himself for me. The last few years have been so traumatic for me that I have felt alienated from everything and everyone, and like I would never be myself again. Part of my healing in this latest phase of my journey has been to investigate for myself what really happened and to face the truth around my brother’s suicide, to ask questions I had been too freaked out to ask before, to recognize and re-claim my own experience of what happened after a truly dysfunctional family response that left me confused, dismayed, and even more traumatized. I called my truth- seeking mission “The Immaculate Heart of Mary Detective Agency.” I thought this appropriate because the sword that pierced Mary’s heart, Simeon said, was “so that the secret thoughts of many may be revealed. I wanted to truly love my brother by understanding all of him, not just the parts that I had enjoyed so much all of my life, but all of him. I wanted to try to understand what drove him to do what he did. I realized I didn’t have to wait around for people to quit lying to me and tell me what was going on. I could find out for myself. So I started asking questions and interviewing people who had the information I wanted, or a different perspective from my own as the sister and room mate I had been at the time. Unexpectedly, the whole experience of the IHMDA has been empowering, though I uncovered rank injustice and malice I hadn’t known some people were even capable of. I feel more alive than I have since all this tragedy began. I have a glimmer of an idea that I have a life and a future. It seems to me that Mary’s heart has helped lay bare many truths, and strengthened me to deal with them. I am not sure what I will do next. But it seems God thinks my next step is to forgive. That message was in last Sunday’s Gospel. It seems to pop up everywhere I turn. I seem to read or see or hear something about forgiveness every day. There is hardly anything I have not lost to some degree in the past couple of years of shock and trauma; my home, my life savings, my family, and the cohesion of my group of wonderful friends. Everything is strange now. I have even felt like I lost myself. I am grateful for the good relationship between my daughters and me, though honestly, at times, even those sacrosanct relationships were violated and temporarily distorted by lies and manipulation. What do I do with this horrible story? Sometimes I can hardly believe it myself. How can I forgive the unforgivable? And how can I ever be a whole person again? How can I bear this? I have been asking all that for a good while. I realized, praying Morning Prayer from the Liturgy of the Hours today, when I read this reading, (above) the answer to these questions. “This is how,”Jesus says. I thought about this. It is a miracle that the thing I have not lost or had to re-negotiate, so to speak, is my faith in God. Even though I have been broken inside beyond anything I thought it was possible to experience, I have an inner rock solid foundation of faith that God has not let me lose. I have discovered that, as St. John of the Cross speaks of in his Ascent of Mount Carmel, I am “supported by faith alone,” now, in spite of how disjointed I feel psychologically and socially. No one and nothing can take me from Christ’s hand. He is even more real to me than I am to myself. And even though my heart is broken, it does know it is safe. It does know Who it belongs to and Who lives there forever. Not even my own death will change that. In fact, Paul also says that the spirit of Jesus in us is so real, it is that power that will raise our bodies from the dead. All the lies and malice, misunderstanding, persecution, blame, rejection, trauma, loss and grief I have suffered, and that the whole world has suffered, are no match for the Truth of God who is Love, and Life. In a way, in comparison, these terrible things are not even real. And I am glad to be only ashes and dust.